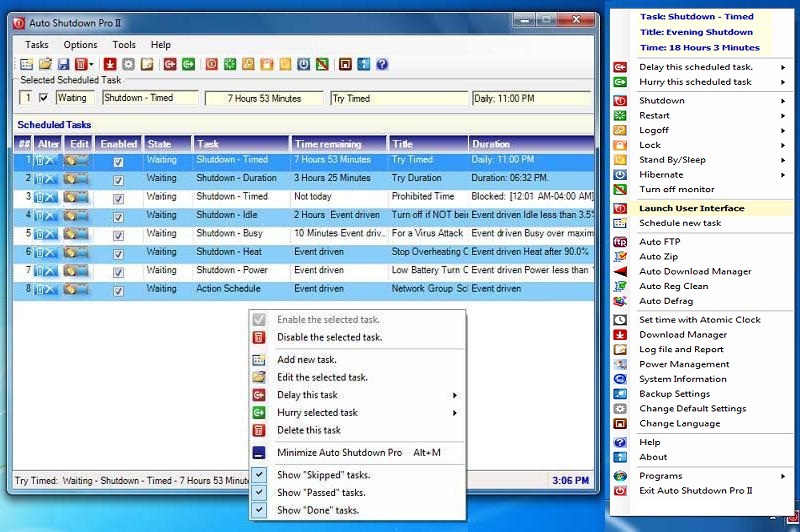 For 32 and 64 bit Windows 7, 32 and 64 bit Vista, and 32 bit XP Auto Shutdown Pro II is an automation launcher for scheduling of multiple tasks to shutdown, hibernate, sleep your computer simultaneously based on time, duration of use, busy or idle CPU, heat, and with mobile computers battery charge available in 54 languages with internal tutorials. Based upon your criteria the system will eliminate your computer being left on when no one is using it. Reducing unproductive usage saves electricity and produces longer computer life. User's can set up shutdown, hibernation, or restarts exceptions which delayed till a download ends or while critical programs run. Likewise tasks can terminate or start programs. An optional countdown dialog enables users to skip, delay, or cancel scheduled tasks in the last minute before activation. Users can add or edit an unlimited number of scheduled task events or deactivate or delete others. User's can specify specific blocks of time where no one can use their computer. This parental control keeps children off the computer after bedtime. Professionals' value blocked time because this security feature protects stored confidential documents and financial records from being stolen from their computers while they are away from the office even if the thief has the computer's password. Time tasks can be set for daily, weekly, monthly, annually, once, and also blocked time. The following scheduled tasks are supported: Timed, duration, idle, busy, heat, insufficient battery power, sleep, power on, restart, log off, lock, hibernate, turn off a monitor, launch or terminate any program, open and display a file, open a URL, and show a message. Network Administrators may with a single schedule hosted on their Internet web site administrate the task schedules of computer groups of any size simultaneously. The program is perfect for work stations, laptops, and notebooks for home or office use. Recent Changes: This release is the first release of Auto Shutdown Pro II with a 64 bit version as well as 32 Bit version for both Windows 7 and Vista. The same setup program works for both 32 bit and 64 bit computers, but installs different programs and libraries for the 32 bit and the 64 bit environments. Additional Requirements: Mircrosoft .Net Framework 4.0 Full for all. 64 Bit CPUs also require Access Connectivity Engine.